A taste of what I'm working on now: Neoliberalism and the Athleticization of Everyday LifesteemCreated with Sketch. In the post-industrial United States, athleticism pervades popular culture and everyday life. Sporting events and sporting cultures of many scales can act as occasions for the massive circulation of capital, technologies of modulating interest and desire, microcosms of social formations, vehicles for identification, allegories for political struggle, and training grounds for gendered and racialized subjectivity—or, indeed, as all of these things at once. Moralizing and potentially harmful notions about physical fitness make claim to the authority of medical discourses, circulating as common sense knowledge about the “should” of bodies and of lifestyles. For those with the will and the resources, exercise regimens invade leisure time, and a lingering sense of obligation invades the consciousness of others who do not. In this project, I will show not only that the athletic is everywhere, but I will argue that the logic of the athletic is fundamental to the understanding of the body under US neoliberalism. This introductory chapter tracks the historical genealogies of athleticism and fitness ideology as these paradigms operate within the American neoliberal context, with particular attention to the emergence of preventative medicine and contemporary exercise science in response to the “heart attack epidemic” of male, white collar workers during the 1960s and the related panic about the physical ills of post-war “affluenza.” I argue that the mainstreaming of leisure-time physical exercise during the 1970s and 80s must be understood within the context of the contemporaneous political-economic restructuring known as neoliberalism and the cultural politics thereof. Drawing from Michel Foucault’s lectures in The Birth of Biopolitics in which he theorizes the subject of American neoliberalism as homo oeconomicus, the entrepreneur of the self who must invest in the accrual of his own “human capital,” I propose that the discourse of preventative medicine and the invention of “working out” are crucial to the growing prominence of a specifically neoliberal form of athleticism—predicated upon quantification and the making spectacle of bodily capacity(-qua-capital)—whose logics have become thoroughly entrenched in daily life. Athleticization invades our lives on a multiplicity of scales at once, from financially powerful mass-mediatized professional sport spectacles, Biannual Olympic gatherings, and college ball to youth soccer, lesbian softball leagues, and step aerobics classes for senior citizens at the local rec center. Since the paradigm shift of athletic apparel as acceptable leisure wear in 1980s, luxury labels focusing on “athleisure” have commanded more and more consumer dollars and the name “Lululemon” has grown past brand recognition into its own gender identity (the ideal form of white suburban femininity). The revenue from health and fitness clubs in the United States—a mere fraction of all the money Americans spend on gear, supplements and apparel for athletic pursuits, medical costs for the concomitant injuries, and tickets and media subscriptions for sport spectacles— represent a $27 billion dollar industry with over 57 million members. The U.S. Bureau of Labor Statistics’ American Time Use Study (ATUS) found that on any given day in 2016, 19.5% of Americans over age 15 participated in sport or exercise, a rate that has only grown across the past five decades. [footnote ^1] ATUS also found that college graduates were more than twice as likely to exercise as those with a high school diploma or less, a statistic that should encourage us to think critically about the class disparities in leisure time, discretionary income, and access to healthcare produced by a neoliberal economy. How did we get here? Today, we take it for granted that exercise is practice to pursue good health. But this commonplace understanding is neither long-standing nor inevitable. Just sixty years ago, running shoes, spandex[^2] and sports bras[^3] had not yet been invented. Common sensibilities viewed sports as appropriate for children’s play only. There will very fews venues in which adults could pursue amateur organized sports, there were no fancy fitness classes or health centers. Gyms were dark, damp places that trained boxers and wrestlers Being buff was considered the provenance of working class masculinity alone, and women certainly were not encouraged to participate. Moreover, the now common presumption that vigorous physical exercise can lead to good health and a slim physique was just beginning to emerge from a few seemingly-radical corners of medicine. In fact, as late as 1968, cardiologists were deeply divided about the role of exercise with the traditional understanding that vigorous exercise was dangerous and should be avoided because it would cause heart attack. Early advocates of exercise, such as Boston cardiologist Paul Dudley White, were opposed by a prominent anti-activity approach to heart health. 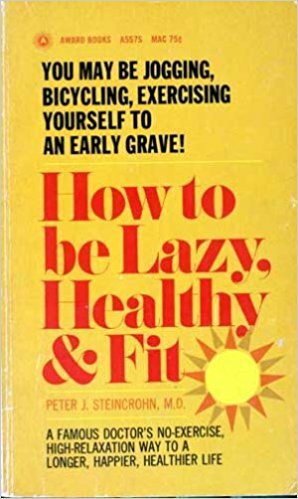 Cardiologist Peter Steincrohn was the loudest of this group: he authored several popular press books in the mid 20th century including How to be Lazy, Health and Fit, in which he argued that individuals are “born with a finite number of heartbeats,” therefore using them up through vigorous activity would merely bring a premature death. [^4] A fervent support of relaxation, Steincrohn advocated “the notion that men and women should do nothing whenever possible.”[^5] Yet things changed quickly: despite its wide appeal in the late 1960s, Steincrohn’s approach could not stand up to the shifts in leisure-time physical activity that were beginning to take hold in US culture. Due to continued research in cardiology, substantial paradigm-shifting advances in exercise physiology by Dr. Kenneth Cooper, and the publication of a very small but wildly influential volume called Jogging, a veritable athletic revolution took hold in the US during the 1970s. The magazine Runner’s World, founded in 1966, had 500 subscribers in 1968 and 500,000 in 1979 at the peak of the American jogging craze. [^6] Since then, leisure-time athletic pursuits—from jogging, spinning, and aerobics to yoga, Crossfit, and marathoning— have continued to be a fundamental component of US popular culture and ideology, and a moralized belief in exercise as panacea has become naturalized in mainstream healthcare. (#)[^1] “Statistics & Facts on the Health & Fitness Industry.” Statista: The Statistics Portal. (#)[^3] Given, Karen. “From The 'Jockbra' To Brandi Chastain: The History Of The Sports Bra.”WBUR, 24 Feb. 2017. (#)[^4] McKenzie, Shelly. Getting Physical: The Rise of Fitness Culture in American. (Lawrence: University of Kansas Press, 2013). Page 103. The @OriginalWorks bot has determined this post by @hella to be original material and upvoted it!